Sekolah Victory Plus has finally presented the second annual charity concert on Saturday 28th February 2015. Approximately 150 students actively took part in this magnificent musical performance. Four big divisions in every Thursday’s music lesson has been preparing the music for less than six months. They are choir, band, percussion, and orchestra. The theme of the concert this year is “Music for the Soul”. Indeed, the program itself was a representation kind of music for our soul. With the grand opening song as an ‘Overture’, the orchestra, band and choir together performed “Don’t stop believing” of Journey (Glee version). Elaine, grade 12, led the Sectional Alto Saxophone offering the harmony of peace and humanity by playing “Time for Us” and “Ode To Joy”. Solo piano by Gytha, grade 10, then brought the audience into calming yet elegance movement from Mac Dowell , Op. 46 No.2 “Improvisation” and Adolf Frey’s “Valse-Intermezzo”. Duet flute and piano by Tasha and Jo Yuri played the charming yet famous instrumental Yiruma, “Kiss the Rain” and evergreen light-jazz “Fly me to the moon”. String sectional led by violinist Irwan, grade 12, afterwards performed the everlasting classical “Canon in D Major” of Johann Pachelbel. 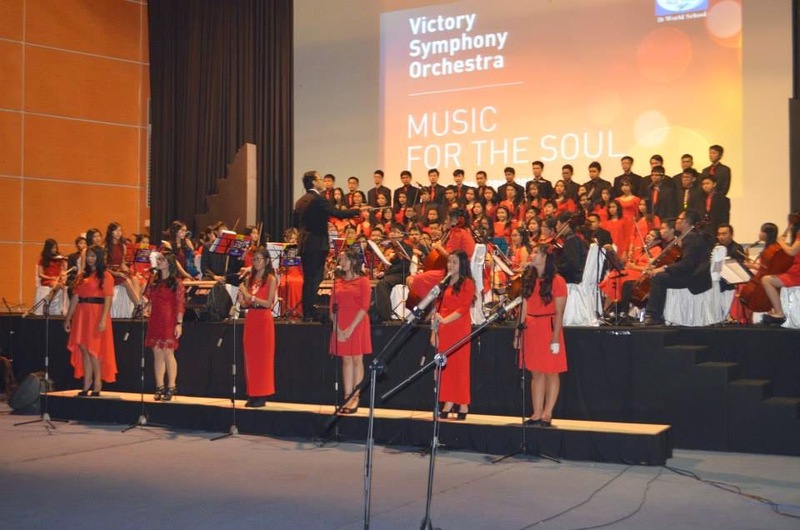 Victory Symphony Orchestra invited the audience to collect their memories of romance, love and life celebration by playing Christina Perri’s “A Thousand Years” and Coldplay’s magical “Viva La Vida”. This year we also have a very uniqe concept in combining music concert together with art auction. In break time led by Ibu Neni, all paintings made by our visual art students have been sold with a spectacular price and will be donated directly to Indonesian Cancer Children Foundation (Yayasan Onkologi Anak Indonesia). This is exactly the main purpose of our annual school charity concert. To give the best thing we can do for the unfortunate souls. After break a group of students led by Calvin, grade 11, performed a fun yet dynamic creative percussion like it was a musical ice-breaker of the show. Joanne, grade 12, led the band to unite everyone’s dream of togetherness by singing Oasis “Stand by Me” and “If I Ain’t Got You” of Alicia Keys. Such a display of united souls praying for a better and happier future, all of them then sang the closing song “Esok ‘kan Bahagia” (D’masiv feature Ariel, Giring, Momo) as it like the ‘Finale’ of the gala show. This magnificent performance from students has been achieved thanks to everyone’s hard work. First credit of course has to go to the tutorial team: Pak Dede, Pak Fanny, Pak Didik, Pak Ujik, Pak Yanto and Ibu Evelyn. In a such limited musical environment and facility they can collaborate together to encourage our challenging students, to improve a lot of technical areas. Credit also goes to committee who has been fantastic in showing great teamwork. Especially Pak Adrian for the bright ideas in making concert handbook, Pak Afif for preparing the superb paintings in Art Auction. Bu Christina and Bu Desi also provided fantastic teamwork for the stage and soundsystem. The biggest credit of course goes to the students themselves. The last week preparation was very exhausting and adsorbing everyone’s energy at the highest anxiety level. But the result at the end is cheerfully amazing and worth it. Donation collected until now is reaching more than 70 million rupiah. Bravo! See you again in next year concert!